The study of shapes and space is called “Geometry”. This word comes from the ancient Greek and means “measuring the Earth”. Because it’s very useful in everyday life, geometry was developed much earlier than other areas of maths. Even the ancient Egyptians over 4000 years ago were already very good at it: every time the Nile burst its banks and flooded the planes, they had to measure their gardens and fields all over again. At school you start learning about simple shapes, like triangles, quadilaterals and circles, and the way they relate to each other and the space around them. You may think that these shapes are too simple to be of any use when it comes to real life, but they are in fact widely used, especially in visual professions. Most man-made objects are built on these simple shapes, while the complicated shapes in nature can be approximated by them. 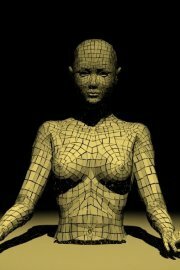 An example is the image below: the complicated shape of a person is generated using polygons. Here are some examples of how the shapes you are learning about now are used in real life. A fashion designer designs clothes out of flat pieces of fabric, which will be worn by 3-dimensional people. The designer needs to make a 2-dimensional plan, a pattern, of what he or she wants to create and then cut the pattern from the plan and sow the pieces together. To create an object that is spherical, for example a hand bag or a hat, the designer can use what is called a dodecahedron. This is a shape made up of twelve pentagons (“dodeca” is the Greek word for twelve) which are fitted together in the right way to form something resembling a ball. The design is based on simple shapes and knowledge of how to turn two dimensions into three dimensions. Precise measurement and being able to calculate the areas of pieces of fabric is important here, too: the designer has to decide how much fabric he or she needs and if things have not been measured properly, they will not fit together neatly. As we’ve already seen above, the geometry of simple shapes can be used for creating an image. Using simple shapes like triangles and rectangles you can build a model for a complicated figure, like a person or animal. If you want your figure to move on the screen, you have to know exactly how the polygons have to change. This involves basic transformations such as rotations, translations and reflections, as well as scaling and knowledge about perspective. Today’s medical imaging devices, such as CAT or MRI scans, are very sophisticated and rely heavily on geometry. Many of them work by taking flat, 2-dimensional “slices” of what is to be depicted, a brain, say, and then re-assembling them to give a 3-dimensional image. The Geometry involved here gets very complicated, and the people who develop these devices usually have a maths, engineering or physics background, rather than a medical one. All of the above have to try and create images of 3-dimensional things starting from two dimensions. But what about the other way around? This is what cartographers – the people who make maps – have to do. Our Earth is a round sphere, but any map is on a flat piece of paper. So how can we represent the earth accurately? The answer is that we can’t – not exactly. No matter which way we do it, there will always be some distortion. On the Mercator Projection, a commonly used map, the size of countries far from the equator is exaggerated, so that they appear larger than they actually are in comparison to countries close to the equator. A representation of the earth on a piece of paper is called a projection. There are various ways of projecting a sphere onto a flat piece of paper, each with its own advantages and disadvantages. Another, very important, thing that cartographers have to know, and which you learn at school, is how to scale an object. The whole point of a map is that it’s smaller than the piece of land it represents, so that you can put it in your pocket. All the real-life objects have to be made smaller, but in such a way that the proportions and relative distances remain the same. Cartographers don’t only measure the Earth. They are also needed to help understand the surfaces of the moon and of other planets such as Mars. Moreover, cartography is used by land surveyors and planners, who decide if and where to build something, and by archaeologists and geographers to map the areas they are working on. There are, of course, many more people that use geometry, for example architects, engineers, physicists (to understand the shape of the universe), and all kinds of designers and crafts people who design or make objects, from jewellery to racing cars. They all use precise measurement and need to be able to move between 2 and 3-dimensional objects. The geometry involved can get very complicated, but it often comes down to building models of things using the simple shapes of triangles, rectangles and circles.